PYONGYANG, Sept. 10 (Xinhua) -- China's top legislator Li Zhanshu visited the Democratic People's Republic of Korea (DPRK) from Saturday to Monday, and attended the activities marking the 70th anniversary of the founding of the DPRK. Li, a member of the Standing Committee of the Political Bureau of the Central Committee of the Communist Party of China (CPC) and chairman of the Standing Committee of China's National People's Congress, visited the DPRK as the special representative of General Secretary of the CPC Central Committee and Chinese President Xi Jinping. On Saturday, Li met with Kim Yong Nam, member of the Presidium of the Political Bureau of the Central Committee of the Workers' Party of Korea (WPK) and president of the Presidium of the Supreme People's Assembly of the DPRK. During the meeting, Li said that the traditional friendship between the two countries, which was created and nurtured by the older generations of leaders of the two parties and the two countries, is a valuable asset for both countries. The CPC and the Chinese government have always treated China-DPRK relations from strategic and long-term perspectives, and are committed to safeguarding, consolidating and developing bilateral ties, said Li. China is ready to work with the DPRK side to implement the consensus between the top leaders of the two parties and the two countries, push forward bilateral ties to a new level, bring benefits to the two peoples and make more contributions to regional peace, stability and development, said Li. Li also called for increased exchanges between the national legislatures of the two countries. Looking back at the past 40 years of reform and opening-up, Li said that China has comprehensively strengthened the leadership of the party with a strong leadership core, adhered to people-centered development, and learnt from other parts of the world based on China's own national conditions. He said that the Chinese people are now closely united around the CPC Central Committee with Xi at the core to strive for the achievement of the Two Centenary Goals and the Chinese dream of the great rejuvenation. China and the DPRK, both socialist nations, enjoy shared ideas and should learn from each other so as to create a better future for their socialist cause, said Li. DPRK-China relations have entered a new stage and enjoy broad prospects thanks to the efforts of DPRK leader Kim Jong Un and Chinese President Xi, said Kim Yong Nam, adding that Li's visit has injected fresh impetus into the bilateral friendship. Kim Yong Nam said the two sides should take the visit as an opportunity to further implement the consensus reached by the two leaders and further strengthen bilateral cooperation in various fields. 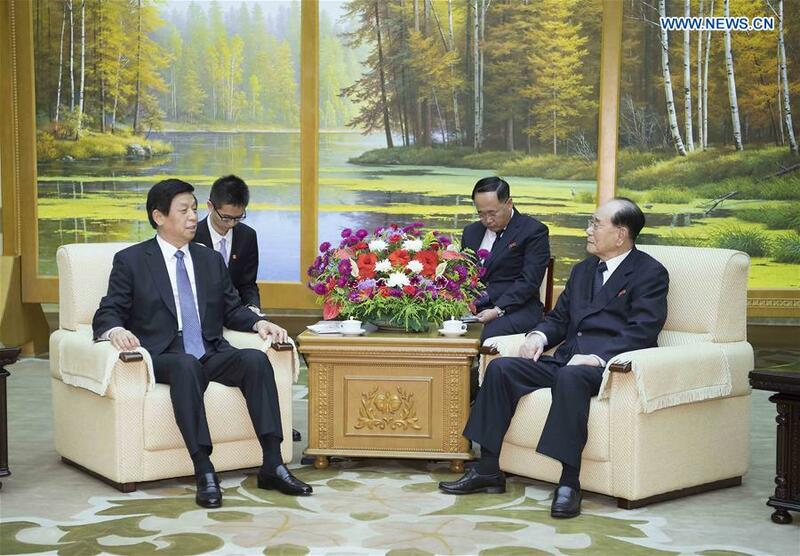 On Sunday, Li met with and presented a signed letter from Xi to Kim Jong Un. Earlier on Sunday, Li, together with Kim Jong Un and other senior DPRK officials, attended the celebrations held at Kim Il Sung Square in central Pyongyang. During the visit, Li also visited the Friendship Tower, which is dedicated to fallen soldiers of the Chinese People's Volunteer Army during the 1950-1953 Korean War. Li also visited the Kumsusan Palace of the Sun to pay tribute to late DPRK leaders Kim Il Sung and Kim Jong Il. Choe Ryong Hae, vice chairman of the WPK Central Committee, greeted Li at the airport when he arrived in Pyongyang.